Friendship with your rabbit begins by spending some time with her every day. This is more likely to happen if the rabbit lives indoors with you rather than in the garden. Let your bunny approach you while you sit in her running space reading or watching TV. Rabbits are naturally curious and will come up to you to investigate. If the rabbit doesn’t run away you can try to pet her on the forehead, ears and back. Remember to approach the bunny from above, not below eye level, or she may perceive your hand as threatening. Rabbits don’t like having their chin, feet or tail touched. As your rabbit comes to enjoy the feeling of being stroked, you may try to brush her, comb her or give her a back scratch. Again, confine yourself to the top of the head, ears and back. Soon your rabbit will start begging you for pets and grooming. Rabbits may not want to be held in your lap. When you sit on the floor or sofa, your bunny may hop in your lap for a moment. Spreading a towel across your lap will make it more inviting to your rabbit and protect you from scratches. Let your rabbit hop on and off your lap of her own accord. Contrary to popular belief, the vast majority of rabbits don’t like to be held and prefer to sit next to you when you cuddle them. However there are times when you have to pick up your rabbit, for instance to take him to the vet. For this reason it’s a good idea to practise lifting and setting him down every day. Follow this exercise with a reward, so your bunny will come to see it as a positive experience. To pick up a large rabbit, put one hand under his chest and the other under his bottom, then lift the bunny facing away from you. Remember to act confidently or your rabbit will sense your hesitation. Rabbits can break their spine if they kick out suddenly, so hold the back legs firmly in your hand. To pick up a small rabbit, put one hand under his forelegs and one under his bottom and scoop toward you. Hold the bunny securely against your body to prevent him from kicking. Picking up a rabbit by the scruff of the neck is not recommended because it may cause tissue damage. Most rabbits are far too heavy to be lifted in this way and a lot of rabbits don’t even have much loose skin with which to pick them up. Never pick up a rabbit by his ears. Take care when setting a bunny down, as he may leap in anticipation. The best method is to bend your legs and quickly release him. 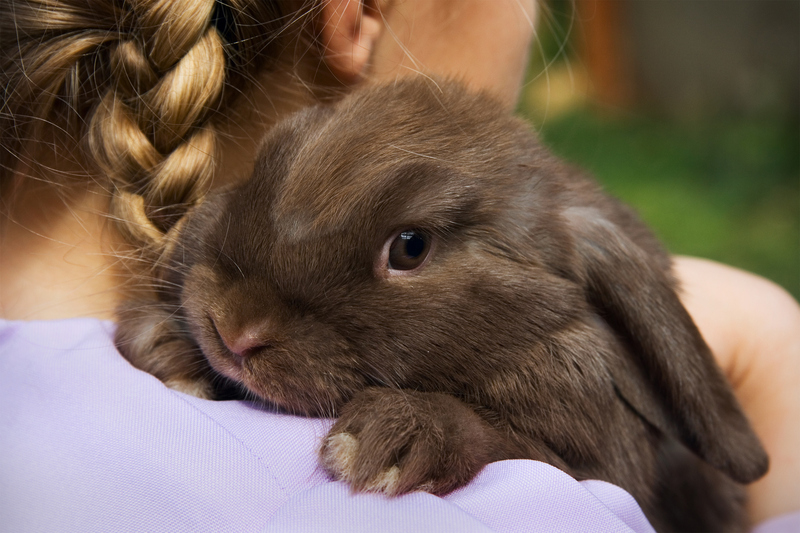 Many adults find it difficult to keep hold of a struggling bunny so we don’t recommend letting children pick up a rabbit for their own safety and that of the bunny.